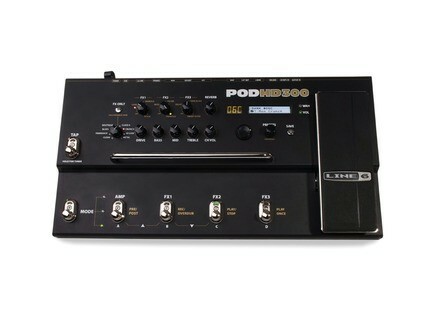 POD HD300, Guitar Amp Simulation Pedal from Line 6 in the POD Live series. tjon901's review"Cheapest POD HD model"
The HD300 is the lowest model in the Pod HD line. Even though it is the lowest model in the line it still has the exact same models that the higher end models have. The only differents is the user interface. This lack of user interface makes it a bit harder to use than the HD500. With the 300 and 400 you pretty much need to connect it to your computer and use the patch editor to make any decent patches. It comes with all of Line 6's HD amp models which there are now 22 of. When you first get the unit there are 16 models. This is a lot less than the 80 or so amps the Pod X3 came with but these amps are modeled in much more detail than those. If you are wondering if you should get this instead of the X3 just think quality vs quantity. The X3 can sound just as good but it will require much more tweaking and skill in your patch making. Utilization is the weakest part of the 300 for me. For something this complex they really do not have that many controls. There is an unlabled 3 way mode switch which switches from amp mode to looper mode to patch mode. You will have to learn what each color indicates. These modes change the fuction of the buttons on the bottom face of the amp. There are dedicated amp eq controls and dedicated effects controls. There is a large expression pedal that can be switched from a wah to a volume pedal. There are plenty of outputs on the back, anything you would need for working in the studio. There is no on or off switch like on the XT you just plug it in which is kind of unnerving. With only a fraction of the models of the outgoing POD units the detail in the modeling of these units is much better. It is easy to get a good raw amp sound from this unit. Me being a mostly heavy music player the low number of high gain amps is kind of disappointing but the models it has are good. The amp has all the classic amps modeled in it. The models I find myself using the most are the JCM 800, Bogner Uberschall, Mesa Dual Rectifier and ENGL Fireball. It has several old Fender blues amps. I just wish it had a Roland Jazz Chorus or something with a really pure clean sound. The amp models sound good but you pretty much have to use the computer based patch editor to make up the patches. The user interface on the unit is too cluttered and the tiny LED screen doesnt help as much. The big screens on the X3 and the HD500 are much better for creating more detailed patches on the unit. If you are looking for a cheap way to have a good sound this is a good unit. It can be used lived with a PA or power amp and it is also great for just home studio stuff. Your first few days with it will be the toughest as you learn what all the functions do and make all your favorite sounding patches. With the 400 and 300 you pretty much have to use the computer based editor to make the patches because the screen on the unit is too small and awkward to use. If you just want the HD amp models and can edit everything on the computer there is really no point in getting the more expensive models because the amp models are exactly the same throughout the line. This is a great unit for effects only. The amp models and distortion are simply terrible. They don't sound natural or real at all. I like POD stuff when using only effects. This is a great unit for that purpose only. Here are the amps models that are featured in this unit. The delays and modulations tone are very good and I highly recommend them if you have a great amp and need to run and all in one effects unit ins the effects loop of your amplifier. I mainly use delay effects, flangers, chorus, and phasers. This unit will do all of those and o them pretty well. I like the multiple delays settings and variation that this unit has. And the ability to call them up in a stored bank on the fly is a great feature to have. These units new come in at around $330, which is a great price for a very useful and resourceful effects processor. You can;t even buy some one effects pedals for that price. Try spending that kind of money on a T Rex pedal or a Zvex pedal. I would recommend this unit to anyone who needs an all in one effects processor and doesn't care about have a high processor performance. This unit is simple and decent enough sound quality. starkitsh's review (This content has been automatically translated from French)" magic box"
POD HD 300 features ... see in bold. relatively simple configuration provided grind the machine regularly. the factory presets are used as filler ... nothing is good. I have downloaded a hundred sounds on custometones of line 6 and changed my style. knowing that I have paid 120 euros used a very nice girl ... I think the quality is the appointment (for 120 euros ), easy and cheap solution that fits all conditions (live studio ...) as well as to all styles. in this price range I do not know better, I have a preference for delays. New 340 euros is not stolen but occasion ... must be jumped over, at the cost of DD6 boss, you are entitled to a portable studio. I do not see any major flaw in this pedal, many critical coldness amps and the organic side distortions .. it's not really my case, I often add a touch of delay on the presets and the result for me strongly. Vince Brooks's review (This content has been automatically translated from French)"is the ball!" The pedal is robust, comprehensive level of connectivity, it&#39;s just a shame not to have placed an on / off switch, but hey, this is not really necessary. If you like hack, we may feel frustrated because it is not possible, for example, to quibble about the location of the microphone (you can also put one) or change the channel effects (eg you can not put two different overdrives one beside the other). In my case, it suited me, I do not look very complicated things and I think there are already enough to me to have fun. In addition, it allows you to quickly build a sound without getting lost in countless submenus. As the manual downloadable from the Line6 site, it is very clear and sufficient (accessed for a little startup) and editing sounds is very simple, especially when using the appropriate software (I do not work for elsewhere without the software, it keeps me from going through the manual and have to do it by hand on the pedal). So the most important sounds! I use the POD primarily at home and it is directly connected to active speakers Behringer (and connected to the computer to edit the sounds with the software). I also use it for rehearsals and concerts, and is then plugged directly into a mixer. I did the update from its acquisition, so I enjoy include the 22 amp models instead of the 16 initially available, the Soldano and Plexi. I mainly play with Ibanez Prestige RG 2620 and a U.S. Fender Strat modified with a Seymour Duncan SL59 at the bridge, but I now also the opportunity to play with a Gibson SG. I knew the quality of the effects since I already had the excellent M13 that I bought to replace (not get rid of it!) Some of my favorite pedals I was using with my Fender Deluxe (mainly time and modulations). Not surprisingly, almost all of these effects is there, with the same quality, and there are even some that I did not on my M13 (whose excellent vintage preamp). I think overall the sounds are very good, as long as we know the first sound is desired, we know how to get there by manipulating the device, and we have proper equipment to amplify. We must also accept that the report will be anyway very different than that obtained by listening to the sound coming from a tube amp, moreover if you play in front of the amp, but that it is transplanted by a microphone, Line 6 offering here the sound of an amp transplanted by a microphone. I think I still have lots of things to discover with this device but I love playing with simulations and Hiwatt Twin for clean sounds, the JTM-45 and Park 75 for crunch, and Plexi Soldano for further satus, not to mention Dr. Z and Divided by 13, which have a very nice crunch brilliant ... I can not tell you if these simulations are close to the original models because I do not have, however it sounds and I find them pretty close to what I have in my ears when I listen to my favorite guitarists. I am not come to a very convincing result with the Vox AC30 model for now (but maybe I am doing wrong that) and I do not use the Hi Gain amp because I &#39;m not too "metalheads". I only use it for almost 2 months, but I waited three concerts (including two big scenes) and a relatively intensive use (I use it almost every day to play with me) to write a review. I also had the opportunity to test some software like Guitar Rig 5 demo that I found really not bad until I bought my Pod. But I mostly played for years before that on real amps, the last which is a Fender Deluxe U.S. with whom I made many rehearsals and a lot of concerts, and I used to complement the M13 with good overdrive pedals (Tubescreamer Ibanez, Fulltone OCD, MI Audio Crunchbox, ...). Let;s be clear: my Pod HD300 never replace nor my Fender Deluxe or my good old analog pedals (which are beginning to dust). But for my needs (home recording, possibility of sound without disturbing the neighbors) and the many services it makes me (I no longer carry my big tube amp - heavy, bulky and fragile - I can move from one sound to another completely different without&nbsp; tap dancing, I can do without my annoyed friends rehearsing musicians&nbsp; because it is too loud, I can go to a jam with just a guitar and pedal , ...), I do not regret my purchase! You just get used to hear yourself differently at reharsal or&nbsp;on stage (mainly in the back, but there are other solutions, especially if it is plugged into a Tech 21 Power Engine) and accept some small disadvantages of digital and this kind of system (it depends on a good&nbsp;rig - mixer, speakers, ... - and skills of the tec and then it is true that visually onstage,&nbsp;it is less&nbsp;&nbsp;flashy than the&nbsp;guitarist who has his big stack behind him with a big pedalboard full of beautiful and expensive&nbsp;pedals ). And for the price, frankly, it is unbeatable!! tarz200tdi's review (This content has been automatically translated from French)" Excellent for the price"
Everything has already been written. The interface PC / Mac is very complementary, and greatly facilitates the editing. The case is pretty solid. However, I put a little damper on the strength of the pedal switches, down sharply from a FBV shortboard the same brand for example (I've already replaced one in warranty, and I have another that starts to wane a bit). My only regret about this model compared to its big brothers: the lack of an effects loop that would connect as a simple multi-effect plug in 4 cables in the loop of a tube amp. This is a very logical Line 6 ... In absolute nothing complicated, but it is not immediate departure. So with my IQ oyster manual was helpful in the beginning. Editing is pretty good, but with limits on chaining effect that did not top models. Initially I used only the software, but with practice I publish more often on the POD. Output is in line headphones (marshall major) or Mac (iMac) or a Tech21 amp power engine. > Line mode, I am particularly pleased. While it will never be worth a good tube amp, but it was still something very convincing. Again, things are not immediate. I found quite quickly cleans and crunch that suited me completely. for distortion sounds, it was longer. I understand some who say that the hi-gain oriented simus are bad ... Nevertheless I just say they are seeking a job to sound musical way (gain settings / volume, EQ, simus HP and mic are to handle sparingly ... interactions are sometimes bizarre). > When this amp is less straightforward. I have long used the mode "preamp" for my sims to minimize, because they can not disengage completely, simus HP. Since then, with the last update that makes possible this release, I came back to "full", and it is more natural. After that, the limits in this mode probably take less POD itself to the full of power and speaker on which the fact out. Used since July 2011. Before I was POD 2.0 + FBV controller. The value for money is good when it is found used in very good condition. If it again I will. However, the day he let me go I go to one of his older brothers (400 or 500) to find a loop and leave me the possibility to use multi indeed simple. 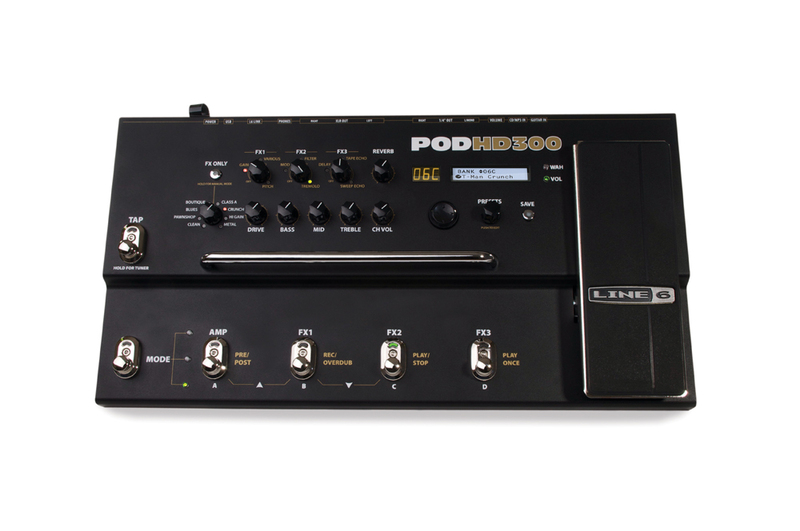 Lloran's review (This content has been automatically translated from French)" Good product from Line 6"
On the characteristics of the pod HD300 the basic principle of the machine is to provide a range of simulated amp and speakers most of the settings on each level of amplification and effects to add. The pedal comes in the form of a box that looks sturdy (metal casing and solid buttons feet) and a switchable volume pedal and wah wah. The idea is to simulate the amps and speakers, it will go on a public address broadcast live neutral plug the mixer. Symmetrized outputs (2 XLR d / g for stereo effects) are here for. The use of the pedals is relatively simple, at the foot of the buttons to press to change the 4 sounds per bank and 32 banks for a total of 128 sounds to be programmed. You can not really fully define a sound during a rehearsal or concert. Change the volume or dose saturation, equalization or reverb used is relatively simple. Change the value of delay or chorus effect is more complicated in the heat of the moment. You can also 'turn' modeling amplifier and speakers to go the direct effects (flat) and use the pod as a foot of luxury. I did the test in the studio (live music) between the simulation pod and hd a Marshall JCM 800. It is clear that the result can not be entirely satisfactory but it's still really close. The rest of the simulations is, I venture to speculate the same ilk. A digital tone gives the opportunity to retune between every song. I never used the loop so I will not dwell here on this feature. The adjustment effects through a step by step graduation and some purists may regret not being able to Backs values. I changed the system against the effects BEHRINGER HD300 and I am totally delighted. We do covers of pop rock band and the ability to stick as close to its original, or away from it is perfect, the sound library available online (after registration at the site of Line 6) is breathtaking, and gives a good indication of sound construction for groups. The other guitarist uses a DIGITECH RP500 is a good machine too. In terms of money that is certainly what is the best currently out Line 6 updates the program from time to time with new amps and new settings. I have no doubt that there will be better in some time and / or it will not satisfy anyone who needs more effect or seeking a special sound but it is sufficient for all musical applications of live band in small spaces. jerome.b's review (This content has been automatically translated from French)" good things ... and bad ..."
the config is not very easy at the beginning I found. but I've had a week and I started to dip. on the other hand have to be careful because in the live action, if it is wrong instead of changing the preset you press 2 buttons at the same time and it changes the bank .. I think with the AC drive will become logic. the manual is not super clear we must spend time on the machine. I specified that I bought the pedal to avoid having to take my amp light heavy and bulky (Blackstar). no surprises compared to what I had in me, it's good. we can start properly set. for its clear I find an entry for direct sound, it sure is square is not at all ashamed. I had already done a live PA without direct input simulator, and it is day and night. although its missing a little bit of everything safe and roundness, but it's good. I'll still try to tamper with AC to see if we can do better. the effect is rather realistic, but it's true that we have no choice in the total coupling. Anyway for those who want to base effects without mixtures is quite amazing enough. I had a bean and 7 years ago, but I had not played on sound system. that is to say, be able to live without an amp with a sound not bad at all. of course we need a return if it is screwed in this case. Jumikael's review (This content has been automatically translated from French)" For this price you can not find better. A good choice." Characteristics have been well summarized so I added nothing, except that I use on mac intel, and that the software runs fine. Better! Considering the price, it's hard to ask for more, I appreciate enormously the addition of metal case, even if the appearance itself is a bit cold. The general configuration is very simple, you can access everything very easily. Editing sounds is relatively easy, although the small screen ... small. From my mac is already obvious. already, why did I buy this multi-effect / amp simulator? I need money, and I sold the equipment that I loved, many pedals tailor shops, a small tube amp that I liked, but I did not want to deprive me of everything from stroke with sub one of my pedals (a tad more) I bought the HD300, on the advice of a seller (which in retrospect was a little kerchief of me because he told me There was no difference with the other hd on the use of effects). Having had quite a pod already, I can say that this one is above the level of modeling, undeniably. However you can use two channels of amp and effects I find x3 allowed to do things quite nice. And then I feel sorry not being able to grind all the sounds. Second point that annoys me: unlike the HD500 (and maybe the 400), we can not put 2 distos a row (like a fuzz overdrive then). Big regret it. The positives: The sounds that I could create (especially with the vintage amp simulation) have a real nice grain well, there is dynamic, it's simple to use, and effects rendering is really nice (I was even surprised by the simulation of the Big Muff is quite usable). The looper is the most intuitive I have ever had to try (I already had a digitech home), and at this price with everything else is the icing on the cake. His level, I am a success but not a "revolution." Either. Bravo anyway Line 6. I use it since yesterday and I already triturated. I know quite well what kind of products in this price range. And indeed, if we blunder at value for money, it is extraordinary! That, in view of all functions, very affordable and complete. If I had the under, and saw what I hoped to do, I would have taken 500. But as is, it is already very well although I'm sure he'll have to wait for updates to the product is nickel. richardman's review (This content has been automatically translated from French)" A real evolution modeling"
16 amps, 80 effects, sufficient to cover all styles. Connectors already very full for current use. The sound editing is done either directly from the pedal, or through software on PCs. Usage is relatively simple, instructions are provided in French for a first approach to the device, it does not address in detail the settings "expert" but somehow the issue is much more practice using the software, it is visual and quick. I have several points of comparison on models with a pocket pod that I used for 2 years was very convincing but I must admit that this is far to replace my amp tube effects pedal, I had not bought it anyway. I decided to crank HD version always use at home, play quietly and connection to PC. First tests, the factory presets uninteresting and overly loaded with effects. Then create some sounds for me to make my own idea, and good surprise, a good dynamic nuances play out well on the ropes. A little crush on the Gibson 185, Dr. Z, and the bassman, a little disappointed by the blackface and some distos. In fact I would have preferred more choice in distos instead of some effects are difficult to place. a little too flat for the spring reverb which is in the FX1 instead of being with others that also réverb.Dommage Wha is not directly controlled by switch (v / Wha), moreover for once Wha proposed are really good. Try to see if sound is convincing.